This year’s 2017 Fraternity Communications Association (FCA) Conference was held May 3-5 in Charlotte, N.C. More than 80 different Greek organizations came together to enhance fraternity communications through the exchange of ideas, experiences and information. 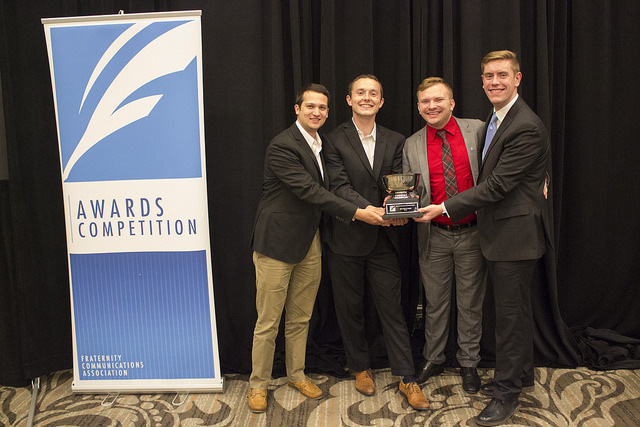 FCA presented Alpha Epsilon Pi’s The Lion with the Fred F. Yoder Award for Overall Publication Excellence. The Fred F. Yoder Award is given for overall excellence of a total publication as demonstrated in a magazine, newsletter or tabloid. All magazines are judged from cover-to-cover on writing, design, readability and relevance of the publication to its intended audience. An organization can only win this award once in a three-year period. The award was named after Fred F. Yoder, a Sigma Chi who served as FCA president from 1970-1971. While serving as the editor of the Sigma Chi Quarterly from 1973-1991, Yoder was the recipient of FCA’s Varner Award and the Ford Award for his distinguished FCA service. The AEPi communications staff would like to recognize Bruce Tria of Tria Designs and Phil Salvo of Royle Printing for their contributions to the success and distribution of The Lion.